The Ireland and Norwich star’s best and worst attributes were on display on Sunday night. Wes Hoolahan was influential as Ireland beat Moldova on Sunday. IT’S HARD TO think of an Irish footballer that has created more debate than Wes Hoolahan over the past 10 years. During the Trap era, there were two schools of opinion — those who felt Ireland were crying out for the little magician in the team, and those that thought he was wildly overrated and a convenient excuse for the side’s failures. The more he didn’t play, the better a footballer he became, some argued. Martin O’Neill, since he took over as Ireland manager, has certainly been kinder to Hoolahan than Trap ever was, starting him in games on a semi-regular basis. Yet the current Irish boss has never seemed to fully embrace the former Blackpool midfielder either. And still, Hoolahan tends to divide opinion to an extent. Some onlookers feel he should be playing as often as possible, while others will point to the fact that Ireland got on fairly well without the veteran midfielder starting in the Euro 2016 matches against Italy and France, even if he was still pivotal to the match-winning goal in the former game. While Hoolahan impressed at times during Euro 2016 qualification and was afforded more chances as the campaign wore on, he has been used quite sparingly by O’Neill in recent times. He was an unused sub in Ireland’s opening two 2018 World Cup qualifiers against Serbia and Georgia, while it was by no means certain that he would have played against Moldova if Robbie Brady and Jeff Hendrick had been available. As it happened though, O’Neill once again placed faith in Hoolahan, and the manager was ultimately rewarded, as the 34-year-old impressed overall, with varying degrees of involvement in the build-up to all three of Ireland’s goals. Although as excellent as he was at times against Moldova on Sunday, Hoolahan has certainly had better games for Ireland and Norwich. There were occasions where the former Shelbourne footballer made poor decisions on the ball. It seemed as if he was almost overly eager to impress Martin O’Neill, having been left out of the previous two games. At times, he tried to be overly elaborate and overran the ball. In certain instances, when his risk-taking failed to pay off, Ireland had several men forward. Hoolahan losing possession left Ireland exposed to the counter-attack and sides better than Moldova might have exploited this vulnerability more often. One of the main criticisms of Hoolahan from Norwich and Ireland fans over the years is that he is ‘too lightweight’. He clearly is not a physically imposing player, and while he uses his body well to protect the ball at times, there are also occasions where he is easily outmuscled. This flaw was evident in the build up to the Moldova goal. Hoolahan losing possession, in fact, resulted in the attack that led to the hosts’ goal just before half-time. There was also one telling moment towards the end of the game. Ireland were 3-1 up. All they needed to do was keep the ball. Yet Hoolahan, ever the showman, tried an elaborate nutmeg and lost possession, again leaving Ireland exposed to the counter-attack as they had several bodies forward. Consequently, O’Neill could be seen and heard shouting angrily at Hoolahan on the sidelines, and perhaps it was no coincidence that he was substituted just two minutes later. If there’s one other criticism of Hoolahan, it’s that for a player who likes to operate behind the striker, he doesn’t score enough goals. In 36 games for Ireland, he has found the net just three times. In the past six seasons for Norwich, he has managed 17 goals — nothing to be sniffed at necessarily, but a player of his calibre should be expecting to get goals more regularly. There are definitely times where the Irish star lacks a clinical edge. Watch the clip below in which he steams forward only to deliver a relatively tame shot at Moldova goalkeeper Nicolae Calancea. Furthermore, for all Hoolahan’s talent, at 34, he can’t be expected to play every game, and it is certainly one reason why he is not an automatic first-choice for Ireland. That said, the Dubliner has started 10 out of 11 Championship matches for Norwich this season, making a substantial contribution to a Canaries side that find themselves in second place right now. On the other hand, club manager Alex Neill is certainly well aware of the need to preserve his Irish star — while he almost always starts, Hoolahan has only completed 90 minutes three times this season. For all the aforementioned flaws, there is no doubt that Hoolahan remains an important player for Ireland. The ball he played for Shane Long’s opening goal was quite simply sublime. It is hard to imagine anyone else in the Irish team having the ability to see that pass. It was genuinely something worthy of world-class pass-masters such as Italian legend Andrea Pirlo or Barcelona star Andres Iniesta. Hoolahan also laid on the pass for James McCarthy’s shot when Ireland re-took the lead, while his nutmeg to set up Seamus Coleman’s cross for the third goal was exquisite — an example of the type of imaginative, ingenious play that some have wrongly claimed is ‘not in Irish footballers’ DNA’. And that sublime moment for Ireland’s third goal was far from a one-off. Hoolahan had been linking up intelligently with Seamus Coleman all game. In the first half in particular, the pair were regularly causing havoc down Moldova’s left-hand side. Hoolahan is always trying things and there were more than a few occasions where his nutmegs or audacious passes didn’t come off, but in his defence, creative players by their nature take such risks — even Lionel Messi plays the odd poor pass every now and then. Hoolahan’s value was also highlighted by the number of goalscoring chances he created on Sunday — twice as many as any other player on the pitch. The Dubliner consequently seems to inspire those around him. Ireland always seem to pass the ball better when he is in the team. While they were admittedly playing against a side widely perceived as the worst in the group, it is probably not a complete coincidence that Hoolahan starting coincided with the first match of the World Cup campaign in which Ireland have had superior possession to their opponents (54%) and completed their highest number of passes (288). 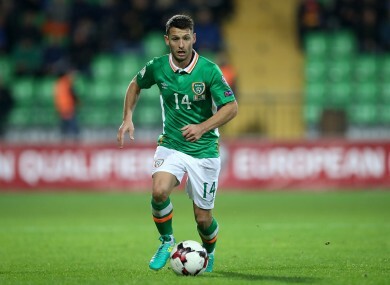 Unlike other Irish players, Hoolahan always goes searching for the ball and is confident enough to hold onto it and take players on, even when under pressure in tight areas. He manages to achieve these eye-catching feats, being able to see a pass and having the confidence to dribble past players despite such attributes becoming increasingly rare, even in top-level football, where risk-taking is often frowned upon. So by committing multiple defenders and opening up the play, Hoolahan brings a totally new dimension to Ireland’s game — the type of variety to the play that was conspicuously absent against Georgia on Thursday night. Like all the best street footballers, so much of Hoolahan’s game is based on instinct and off-the-cuff moments, rather than the type of coaching instructions that drain so many footballers of any personality. In the clip below, 99% of footballers would be content to lump the free kick into the box. Instead, Hoolahan notices that there is a potential two-on-one situation developing in Ireland’s favour and he intelligently opts to play it short, with the visitors almost scoring ultimately. Even the much-maligned defensive element of his game is underrated. Hoolahan put at least two very good tackles in during the match and did especially well at one point to track back and intercept a dangerous-looking Moldovan attack. Where could Hoolahan fit into the starting XI in the future? If recent history is anything to go by, Martin O’Neill’s favoured midfield/attack consists of James McCarthy, Jeff Hendrick, Robbie Brady, James McClean, Jon Walters and Shane Long. Unless he decides to move Robbie Brady to left-back and leave out the much more defensively reliable Stephen Ward, O’Neill would need to drop one of the other aforementioned players in order to accommodate Hoolahan. Leaving out the much-maligned McCarthy and playing Hendrick at the base of midfield is one option. Another would be to remove the hard-working but technically limited James McClean from the team, though omitting the Derry-born winger currently seems unthinkable given how he is playing at the moment. Brady and Hendrick could also potentially make way, but they were the two stars of Euro 2016, and dropping one of these youngsters for a 34-year-old would probably been perceived as a reductive step by some. Furthermore, there is a chance of currently injured players like Harry Arter or Alan Judge coming back into the fold in the near future and providing further competition for places, so Hoolahan certainly won’t be guaranteed a spot in the team from this point onwards. Yet given the class he showed on Sunday night, Hoolahan effectively confirmed his continued status as an invaluable squad member and someone who is as deserving as anyone else of a place in the starting XI. Email “Analysis: Moldova game highlights the best and worst of Wes Hoolahan”. Feedback on “Analysis: Moldova game highlights the best and worst of Wes Hoolahan”.